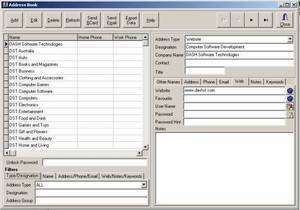 DASH Software Technologies Address Book allows you to store contact information of a Business, Individual or Website. Store the Username and Password of all those website you belong to. Now you no longer have depend on the 'Forgot your password' link. For security reasons, you should also check out the DST Address Book download at LO4D.com which includes virus and malware tests. Additional screenshots of this application download may be available, too.